Hello, my name is Orchid. 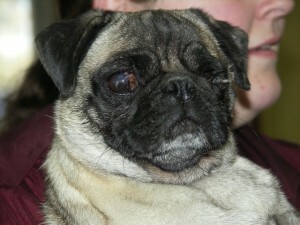 I am a 5 yr old female pug with the markings of a princess. My life is a little confusing right now. All I know is that one day I lived with a lot of other pugs, had babies and lived in a kennel. Now I live with my foster family, one other pug and rarely see the inside of a kennel. I even get to lounge on the couch and watch TV. Oh did I mention that only one of my eyes works. Yeaaaaa, not a big deal. I have been told repeatedly how beautiful I am! My foster mom keeps calling me her princess. I need a forever family that is willing to offer lots of love and kindness. I didn’t understand that until I got to foster care. These people are soooo nice to me that I could live here forever but I am told there are lots of families who need me. Come and visit me and see for yourself our wonderful I am.